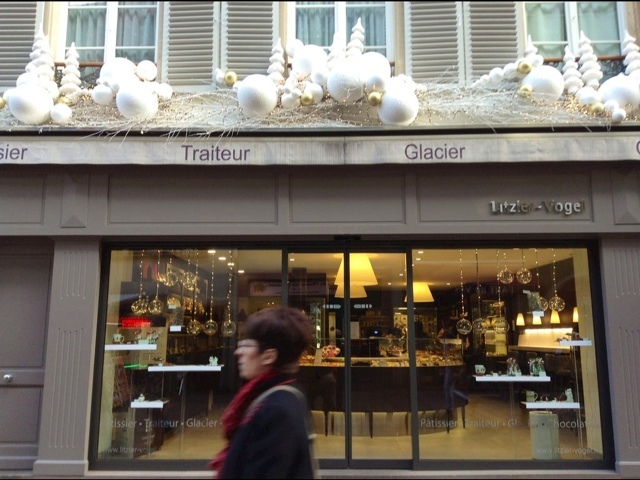 Christmas garlands (les guirlandes) are the rule in Strasbourg like at Patisserie Christian. You'll find them hanging above the ground floor (not to be confused with the FIRST floor in French buildings...ahem). Don't ask me why they place them here. 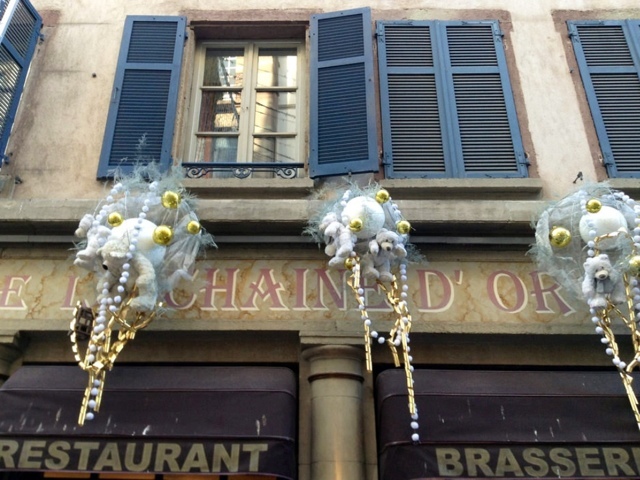 Even a petit chalet in one of the 11 Christmas marches has a garland of hanging balls. Gold chairs hanging...why? Quit sait..
White is the color of choice generally. 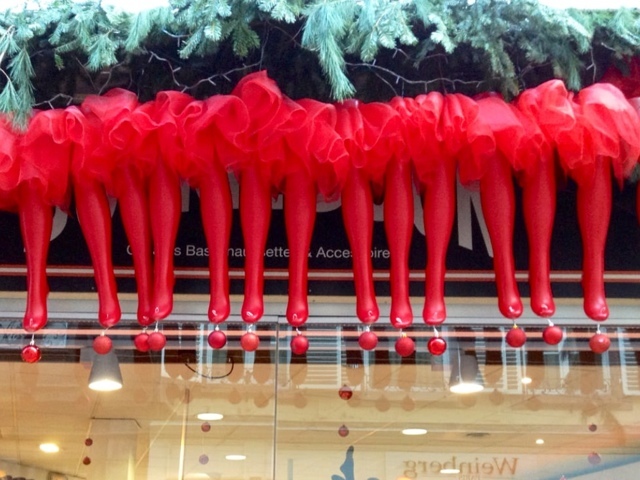 But this stocking shop went for scarlet red. 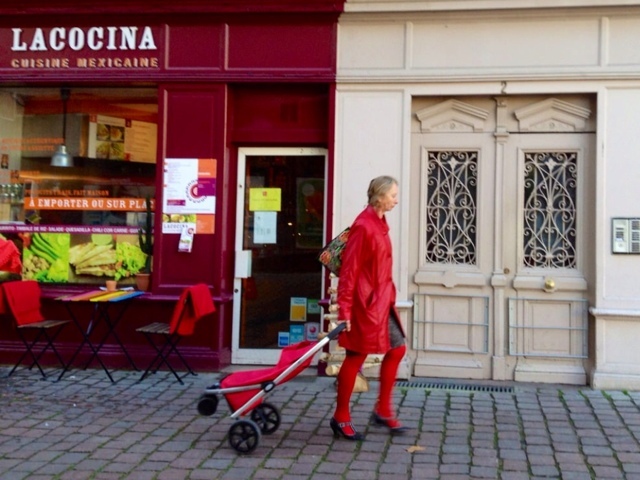 When in Strasbourg wear RED including your shopping trolley. 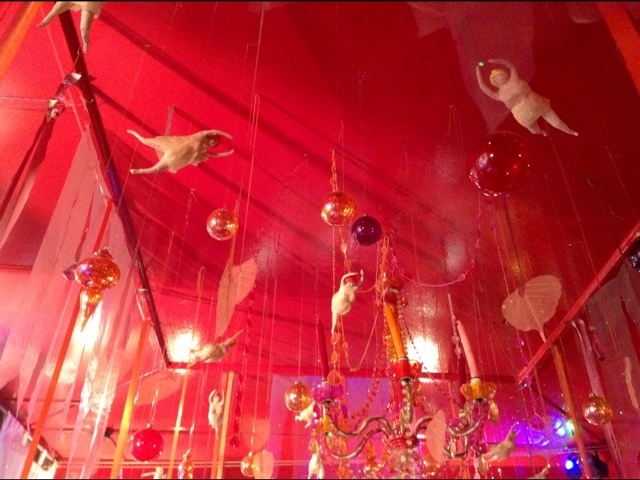 Red hanging garlands inside a little cafe. Traditional evergreen garlands hung outside the little restaurant where I had lunch, Vince' Stub, 10 petite rue des dentelles. 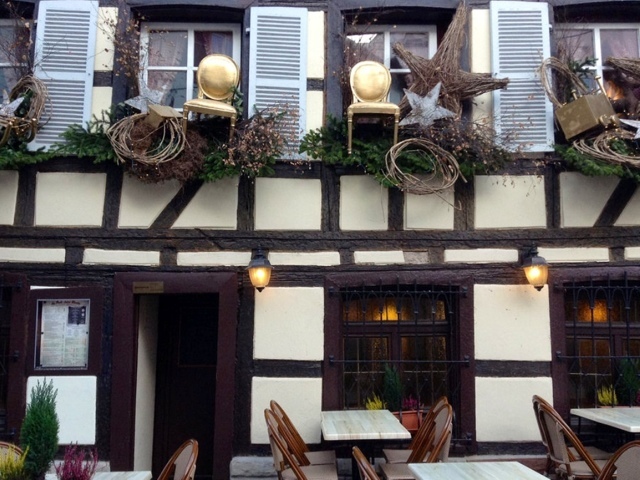 I ate roasted magret de canard (duck breast) topped with foie gras + a glass of Reisling. Talk about going over the top. Travel Advisor rates it 10 out of 1,174 restaurants by the way so get a reservation. After I fell into this ice cream parlor and promptly went to sleep at my table. Zzzzz. I got up, sleep-walked out, leaving my iPad on the table. The nice waiter came running after me. Merci Dieu! Does a 'garland' of buskers singing in front of the cathedral count? Inside the cathedral beautiful garland-style decorations hang from the chandeliers. 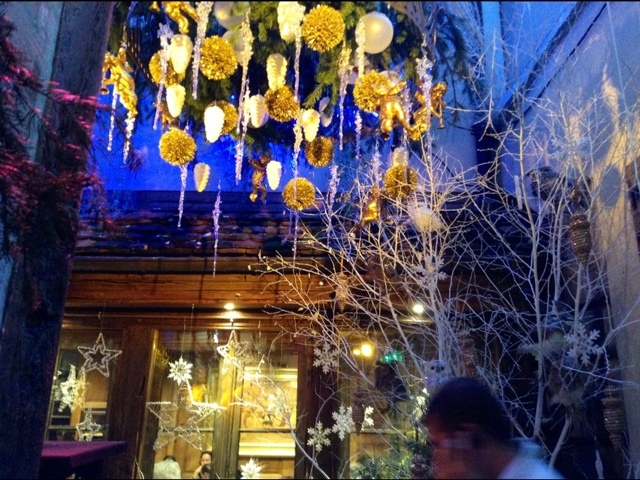 Hanging decorations inside patisserie Christian's courtyard. 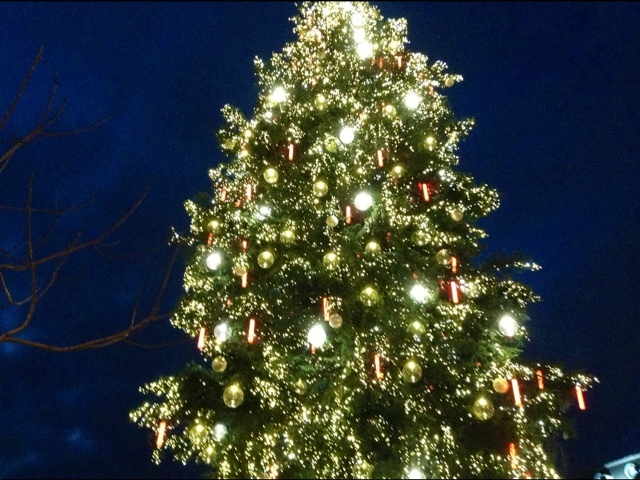 The Strasbourg tree in the main square is the biggest in Europe. 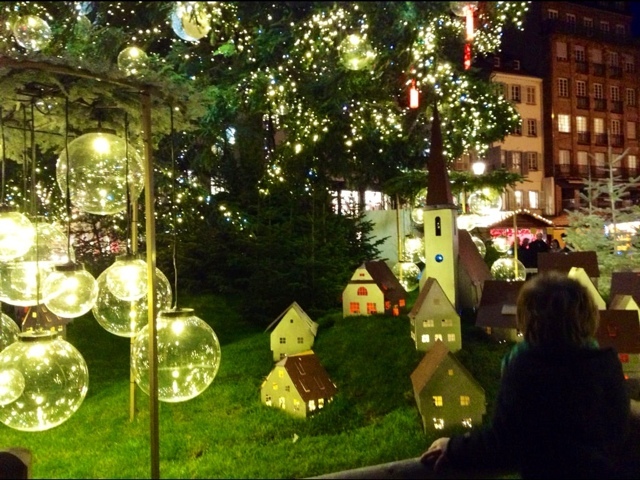 The toy village at its base had this little kiddie fascinated. 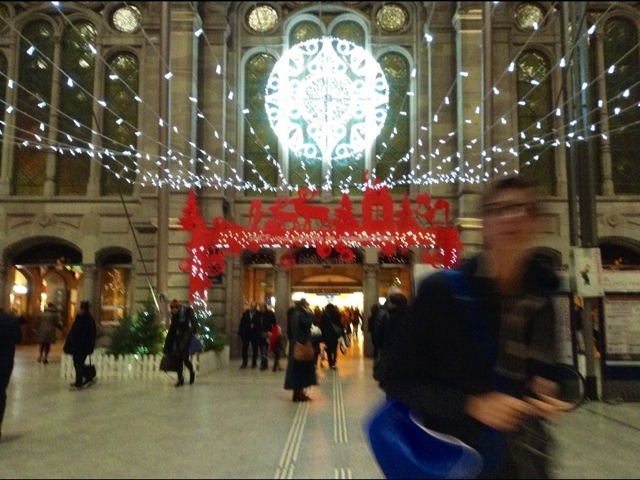 Even the Strasbourg train station makes departing a festive occasion. Beautiful pictures. Know what I missed. 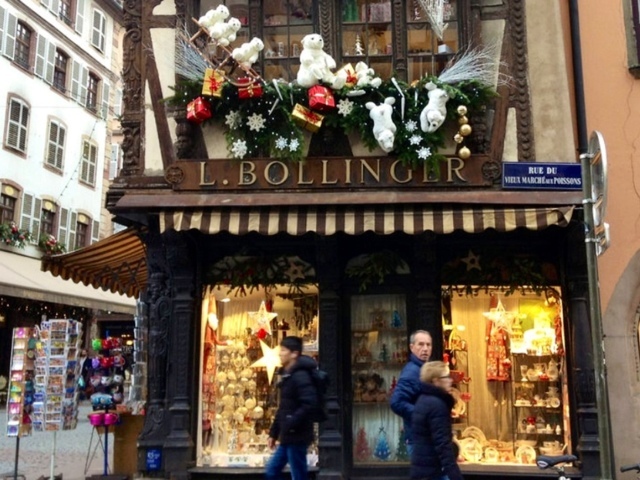 What did the L. Bollinger shop sell? My time in Paris was magical. Have a Joyeux Noel. Love your photos and commentary. You have such a lovely way with words and themes and photos and....and...and...love it all! 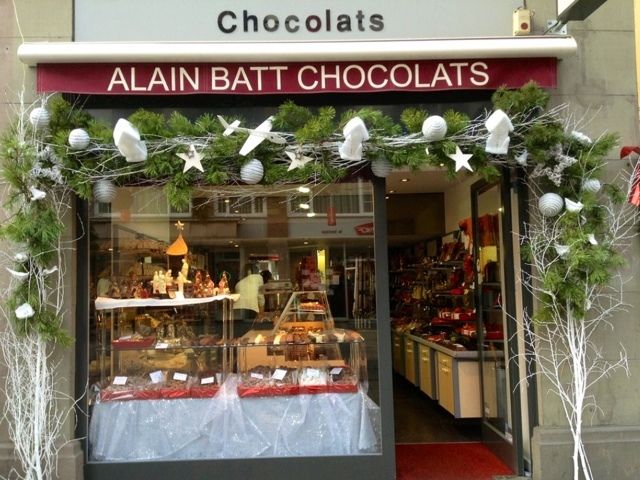 Wishing you Happy Holidays and thanking you for bringing France to me all year long! not sure why my grandaughter's name is on this...it should be leslie has...gotta check this out. Carol, I've made a note to myself that Strasbourg at Christmastime is a joy. Thank you so very much for this series of posts. It all looks like a great celebration...and your being there made it even better! Merry Christmas Carol. It's too long since I've been in Strasbourg. Thank you for seeking out such beauty and sharing it with us. Joyeux Noël, Carol...and mille mercis for bringing Paris to my inbox so artfully all year long. 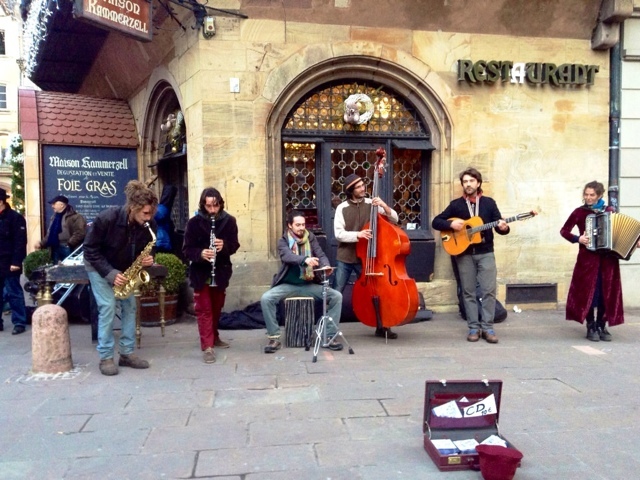 Lovely photos of Strasbourg...its now on The List! Sublime photos, genius tour guide. Merci for this holiday spirit. Duck with foil gras AND a glass of Reisling -- that's what I call a celebration a la Carol! I'm so happy to have ad the opportunity to go to Strasbourg "with" you. 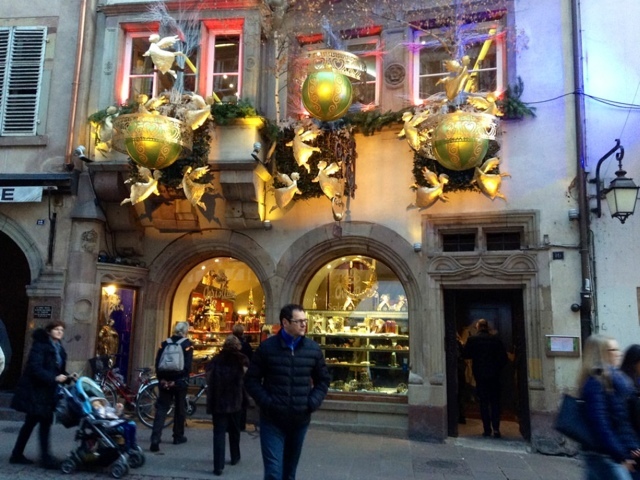 I was in Strasbourg for Christmas many years ago. Thanks for reminding me of the beauty of it. You are a gift to us. It is all so beautiful it makes my heart sing. Merry Christmas. 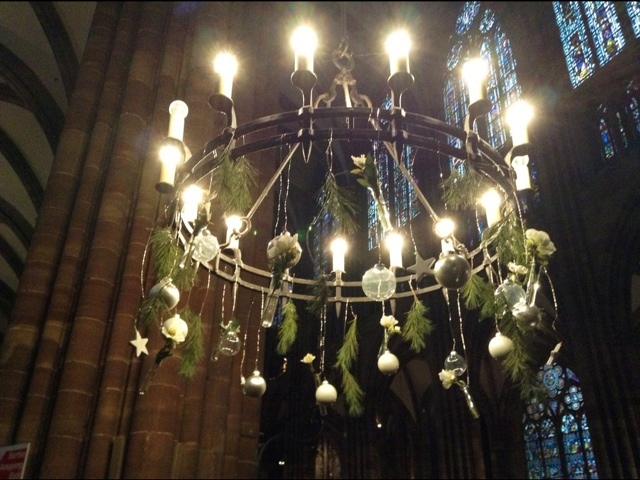 Merry Christmas and best wishes for a joyous New Year. Such beautiful displays Love all the party colors..
Merry Holidays thank you for all your fun Photos and Watercolors. Thank you so very much for all these beautiful shots. After a difficult day with my ailing mother, they cheered me immensely. I have looked at them over and over again. I feel as if I am escaping to Strasbourg. It will definitely be on my itinerary next summer! 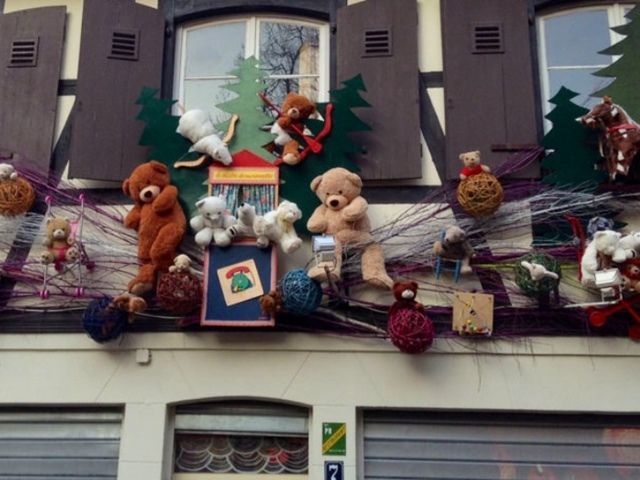 Joyeux Noël, Carol! Merci beaucoup for all of your travel inspirations, your taste treats, your rendez-vous à Paris et environs, and MOST OF ALL --- Your WONDERFUL WATERCOLORS!!! 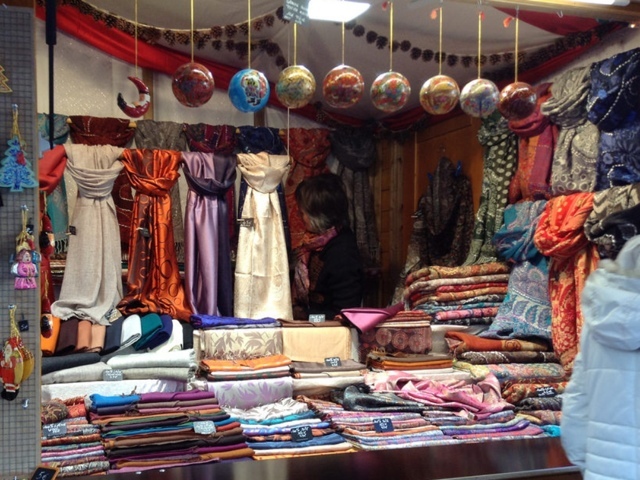 I want to take the time to tell you how much I appreciate and love your photographs that you take and share of France. Love your water colors. You are so talented . Many thanks for the joy up bring to all of us who subscribe to your website. Merci" for bringing a bit of Paris to me each month. I am enjoying both the map and letter subscriptions. I hope that you have a very Merry Christmas and a Happy New Year! A whole string of gorgeous photos, one after the other. Those red stockings sure grab the eye. I hope that you had a great day, Carol!! Beautiful! Hope your Christmas was Merry & bright! Looks so wonderful! Seems like a bucket list kind of place. Beautiful pics. 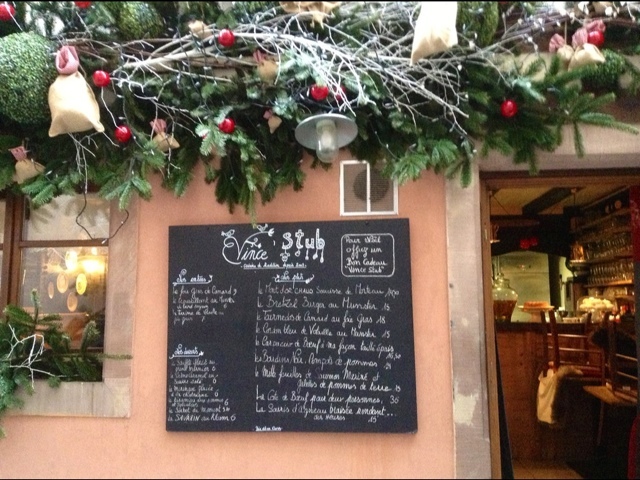 Yes, now I definitely want to go back to Strasbourg in December! How festive can you get? Love the sleep-walking iPad incident! haha!